Important news stories that cover industry practices and related developments. WASHINGTON, DC – December 6, 2016 – The growing popularity of “smart” Internet-connected toys poses significant privacy, security, and other risks to children, according to a complaint filed today(link is external) by leading child advocacy, consumer, and privacy groups at the Federal Trade Commission (FTC). What next for Pokémon Go? With a move into wearable tech, in-game events and global expansion on the cards, Pokémon Go is devising new opportunities for brands to connect with its 20 million plus daily users. AT&T, DISH Network L.L.C., a wholly-owned subsidiary of DISH Network Corporation, and WPP have announced plans to acquire INVIDI Technologies, a leader in providing addressable advertising platforms. INVIDI will continue operating independently under the three companies’ collective ownership, and each company will name representatives to INVIDI’s board of directors. AT&T will hold a controlling interest in the venture. As the largest communications company in the world, more than 120 million customers count on us every day to deliver the wireless, Internet, data and advertising services that fuel their businesses and connect them to their world. You will find yourself connecting communications and technology with opportunities that will take you to places you never imagined. AT&T is currently seeking a Director Advanced Analytics who is a strong leader with the requisite experience and expertise in Big Data analytics solutions. As the largest minority in the United States, Hispanics are a powerful audience. Traditionally, advertisers have reached these consumers via TV networks: In 2014, 75.9% of advertisers’ budgets went to TV ads, while only 7% was dedicated to digital. But more Hispanics watch YouTube than any cable network in the U.S. And, when they want to watch videos that help them stay connected to their Hispanic culture, they also turn to mobile. Here is new data on this audience’s online video viewing behavior. 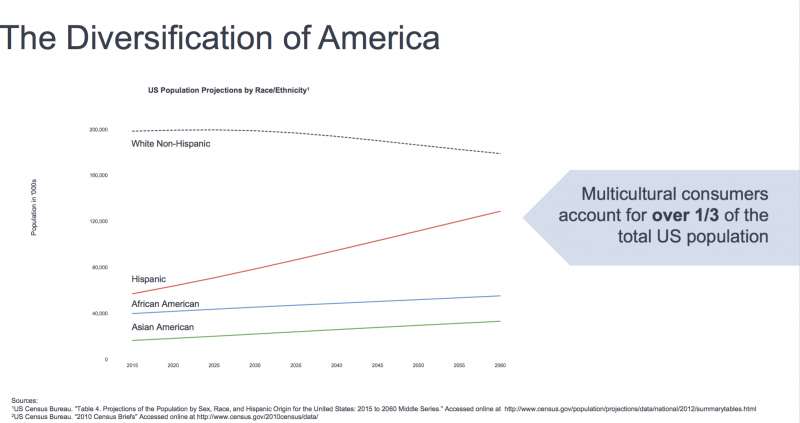 Facebook has developed a solution to reach the US Hispanic Affinity Audience: the most mobile and socially active group in the U.S., in the language of their preference. Being able to cap the frequency of ad delivery across multiple screens is a big desire among advertisers. It’s also why AT&T’s DIRECTV-U-verse-AT&T Wireless cross-screen addressable offering is “very intriguing,” according to Jonathan Bokor, SVP, Director of Advanced Media at Mediavest | Spark. Driving deeper connections with key audiences is the holy grail of marketing. With the boom of social media, this task has become even more complex for marketers striving to make sense of tweets, snaps, stories and likes. Today, Influential, a Data First influencer marketing platform and IBM Watson developer partner, has announced a partnership with Condé Nast to implement its Watson-enabled platform. D2 Media Sales is a joint venture between DIRECTV and DISH, and was founded in 2014 to create a scalable household addressable TV platform for political advertisers. Addressable TV advertising enables us to deliver a TV ad, in a privacy compliant manner, to the individual households of a select demographic or voter segment. We ensure the ad is seen regardless of programming or time of day, both in live or playback modes, by your exact target audience. Turner Broadcasting is partnering with Epsilon, Krux and Oracle to enable advertisers and their agencies to connect to the Turner Data Cloud (TDC), the company’s advanced data management platform (DMP) originally announced at the company’s Upfront last month. excerpt from recent interview with Rick Welday, president of AT&T AdWorks, 13 October 2016. Turner Broadcasting [Time Warner] is partnering with Epsilon, Krux and Oracle to enable advertisers and their agencies to connect to the Turner Data Cloud (TDC), the company’s advanced data management platform (DMP) originally announced at the company’s Upfront last month. COLOGNE-To the world at large, the fate of Yahoo had been a long-running saga that seemed like it would never end. But to AOL CMO Allie Kline, the deal joining AOL and Yahoo is a big momentum boost for the “flywheel” of data-driven advertising and content under the Verizon umbrella. Introducing DLX Proximity, a new Oracle Datalogix location-based audience category. Target audiences based on proximity from home address to surrounding retailers using highly accurate, offline sources data. Using address data on 110MM+ HHs and latitude/longitude coordinates of retail locations, we’ve built audiences that live within a five-mile shopping radius of each store. Today marks a major milestone in the kids digital media industry. We’re extremely pleased to announce the launch of REX, the world’s first kid-safe, COPPA-compliant programmatic exchange. Apple’s Siri analyzes thousands of movie showings and surfaces recommendations for the best times and theaters based on my location within seconds. Spotify knows my music preferences and curates personalized playlists for me. Facebook instantly recognizes my friends in photos and suggests tags with nearly 98 percent accuracy. It’s pretty obvious advertising is reaching the next level – AI, VR, AR, and countless other acronyms, showcase advertising capabilities nobody ever thought possible. Enter The Weather Company and Watson Ads. Watson Ads doesn’t just answer a posed question, it learns and adapts answers based on a number of factors, to deliver a personal experience. ExchangeWire speak with Jeremy Steinberg (pictured below), global head of sales, The Weather Company, an IBM Business, about the practical use cases of Watson Ads in the real world. Global technology company, MediaMath, today announced its unique hyperlocal targeting capabilities to enable marketers to deliver high-performing mobile advertising to users based on their real-time location. Location data combined with unmatched global scale yields a powerful tool that empowers marketers to drive better performance. This solution is in partnership with Factual, a global leader in location data, and leverages their Geopulse Proximity data service, which is uniquely integrated into MediaMath’s TerminalOne Marketing Operating System™. AOL Inc. and Microsoft (NYSE: MSFT) today announced a global, enterprise-level partnership where AOL will assume management and sales responsibility for all of Microsoft's display, mobile and video advertising inventory in nine key global markets -- the United States, the United Kingdom, Canada, Brazil, France, Germany, Italy, Spain, and Japan. AOL will represent inventory from across Microsoft's suite of leading online brands, including MSN Homepage and verticals, Outlook Mail, Xbox, Skype and ads in apps. AppNexus, the world's leading independent ad tech company, today announced the appointment of Gabriel Weintraub as Chief Economist. Currently a professor at the Stanford Graduate School of Business, Weintraub specializes in the economics and optimization of marketplaces, particularly, auction markets.